At the grand old age of 9 months and 5 days old, Darcie has started to crawl. After weeks of wriggling backwards on her tummy, rocking back and forth on her hands and knees and then about a week of being able to crawl but only two paces, she has finally cracked it. I actually think she’s had the ability for a while but has inherited my lazy gene and milked the whole ‘I’m a helpless baby’ thing for as long as possible until the urge to put her fingers in the plug socket got too strong for her to resist any longer. The whole time she was learning to crawl I was cheering her on, encouraging her and trying to help her master the skill. Oh what a fool I was! I should have been showing her how exciting it is to sit still and convincing her she could have her adventures from the safety of her little spot next to her toy box, rather than telling her that the world is her oyster and how much fun she would have once she could go off and explore. It is SO much harder looking after a baby that can crawl. Not only this, but I think there was some sort of package deal on her new skills that meant she also got a new sassy attitude for free. She has realised that she now has the ability to do her own thing and she doesn’t want her boring old mummy to stop her from causing chaos and putting herself in danger. As I move her away from the corner of the coffee table she looks me right in the eye with stubborn defiance, flicks her little pigtails and sassily wiggles her little bum off to stick her fingers in the plug socket. She easily finds her way around my pathetic attempts at baby proofing, pushing pillows out the way and bulldozing past the chair I use to stop her from getting to the oven. I’d been warned about this, but us new Mummies are never going to listen to other Mums who have “been there and done that”. Well, we do listen but we just choose to ignore their advice as we assume our child will be different to the millions of others that have been at this stage before them. 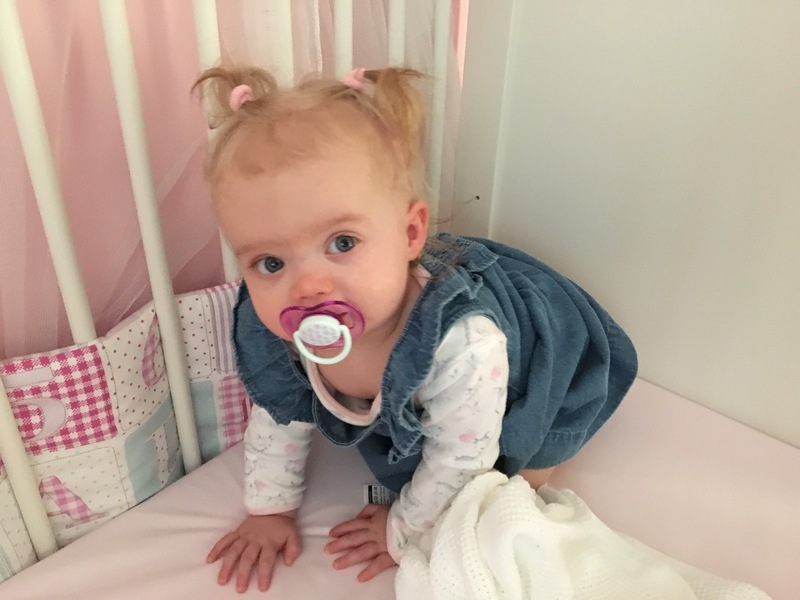 When my Mum first mentioned baby proofing to me and pointed out various things in my lounge that she thought would have to be moved once Darcie was crawling, I pretty much laughed and said ‘Oh it will be okay!’. Now I am eating my words the same way that Darcie is trying to eat the candle that I decoratively placed next to the fireplace. "Things I’ve Learned About Myself Since Becoming a Mum"
"Mummy Gets Fit// My First Buggy Fit Class"